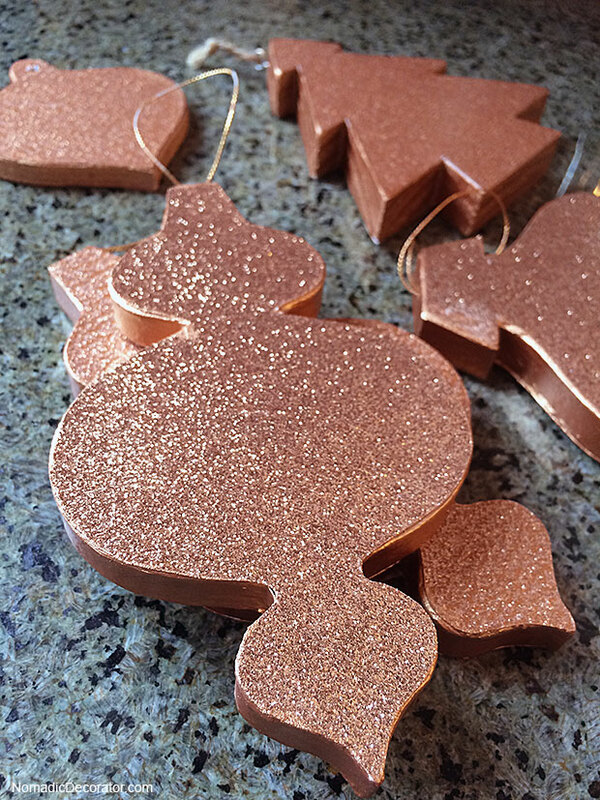 DIY Glittery Christmas Tree Ornaments That Don’t Make A Mess! I’m a huge Scrooge when it comes to glitter. 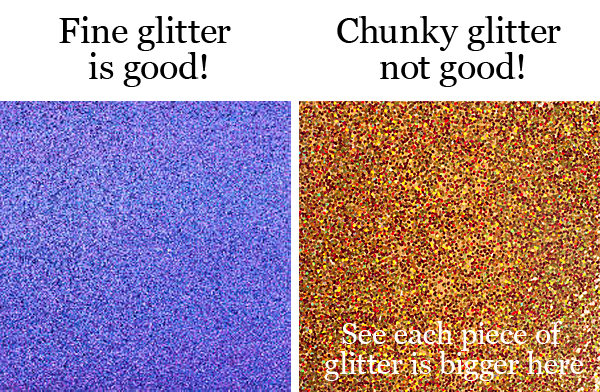 Glitter is banned from my house. Yeah, even at Christmastime. All violators must eat fruitcake. Why? Because while glitter brings a festive spirit to a Christmas tree, it also puts the festive spirit in your hair, carpet, furniture, everywhere. But now, I can put the festive spirit only where it belongs – on the Christmas tree! The solution? 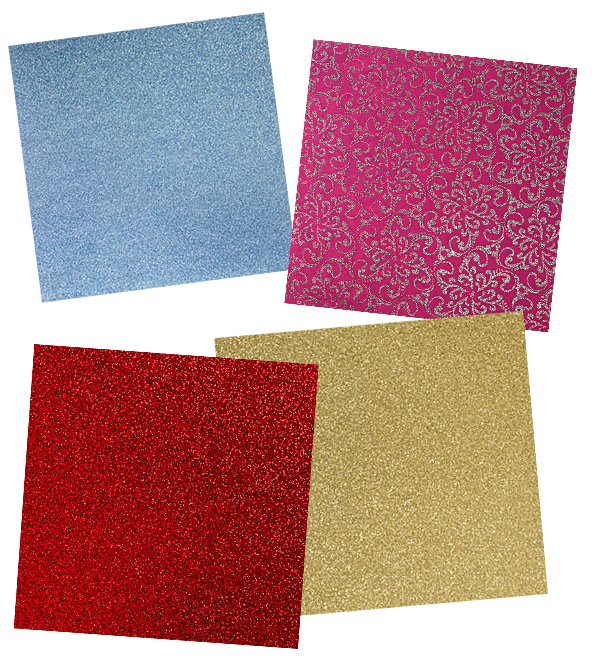 Glitter scrapbook paper. The glitter DOES NOT COME OFF. The glitter stays stuck on the paper, not on your hands! Yay! 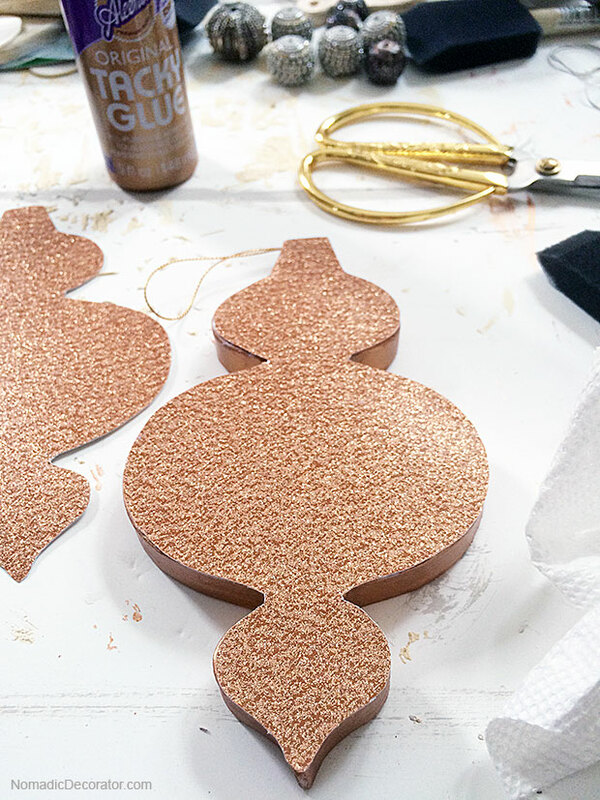 So, today I’ll show you how to make no-mess glittery Christmas tree ornaments. I’m sorry. I’m one of those people who forgets to hold the phone horizontal for videos! 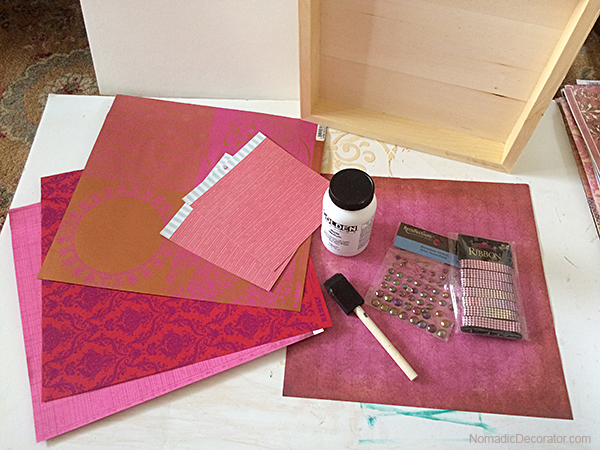 I used copper color glitter papers for today’s project, but glitter paper comes in many colors. 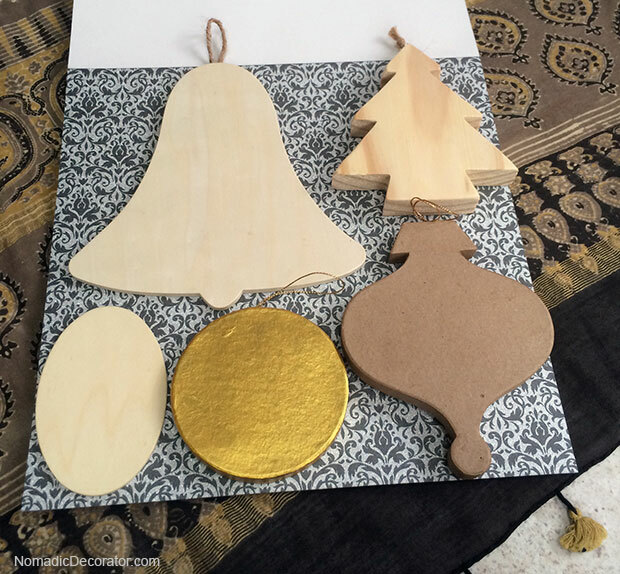 You also need ornaments with flat surfaces, like the ones shown above. 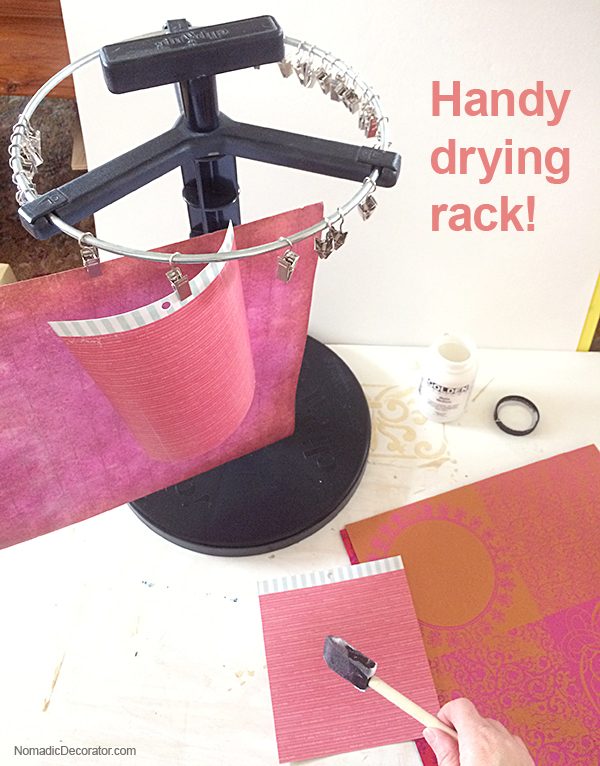 You can use paper mache, ceramic, wood or chipboard. 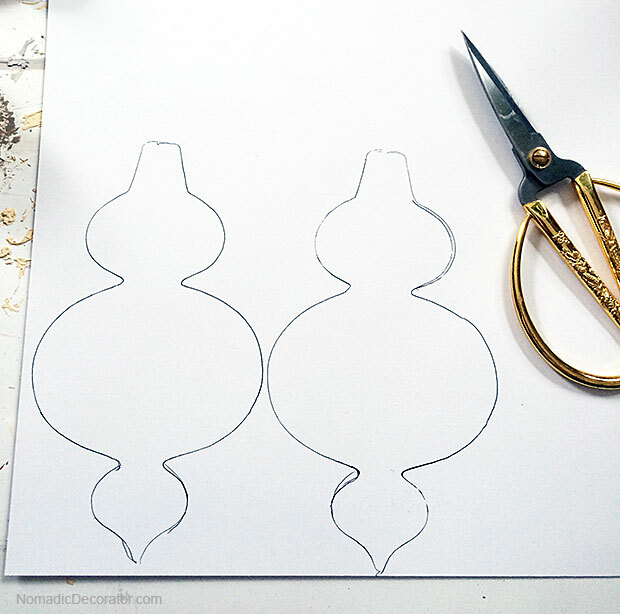 You can buy these ornament shapes at Michaels, JoAnn and Hobby Lobby. Again, buy during their frequent sales and use coupons. Also, search paper mache and unfinished wood Christmas ornaments on eBay and Etsy, under their craft supplies categories. I found there are a lot more choices of unfinished wood ornaments than paper mache. This is so super easy and fast! Step 2. Trace an ornament on the scrapbook paper. If your paper has a pattern on it, you might want to center the ornament over the pattern. I usually draw cutting lines on the back of the paper. Step 3. Cut the shape. 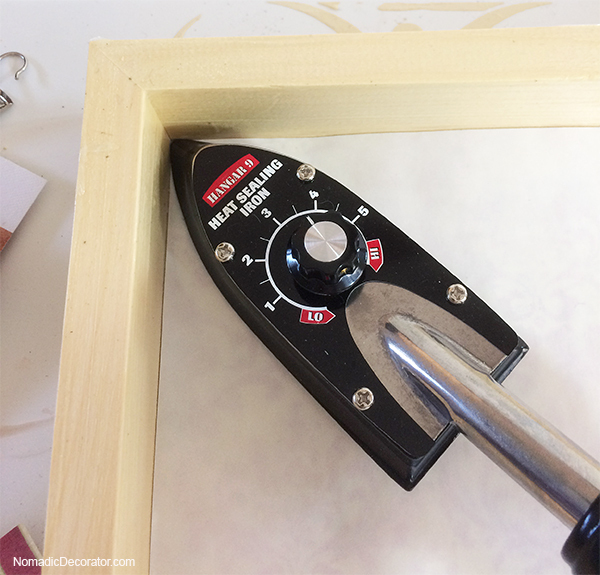 Cut just barely inside your tracing line. Because your tracing lane will be slightly larger than your ornament. Step 4. 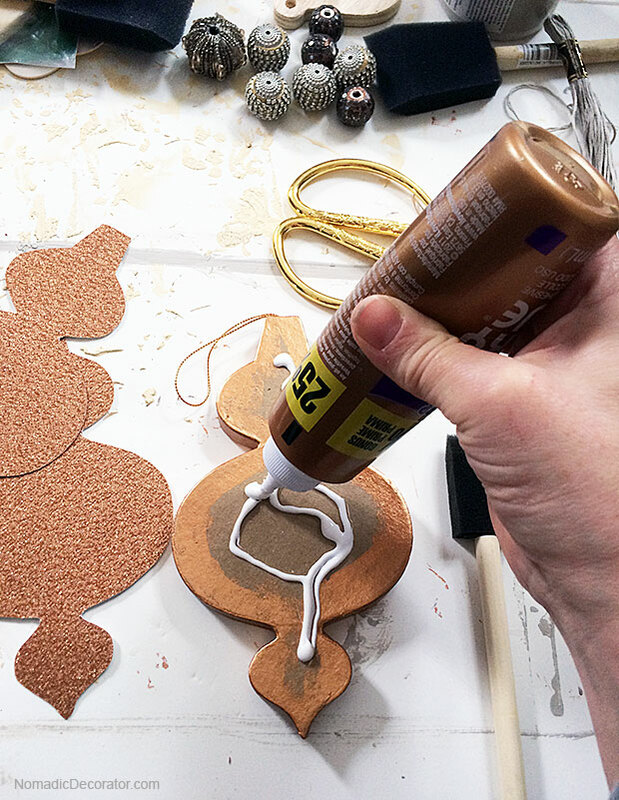 With a foam brush, spread Aleene’s Tacky Glue over your ornament. 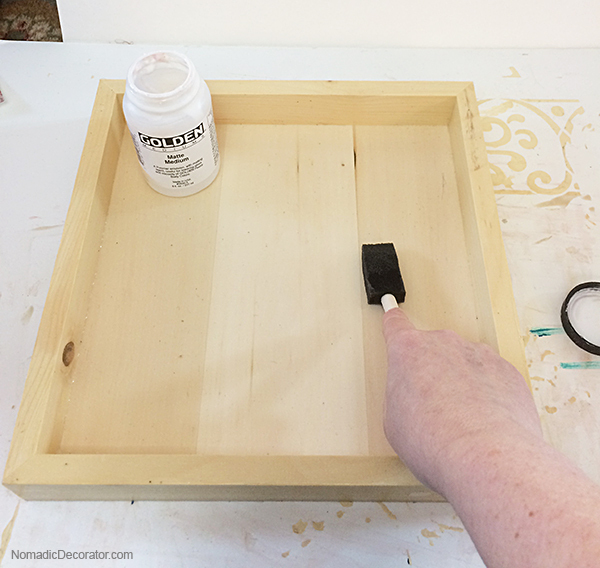 You can use Mod Podge or other glues. I like how Aleene’s Tacky Glue is thicker and tackier, and less likely to wrinkle the paper. Step 5. 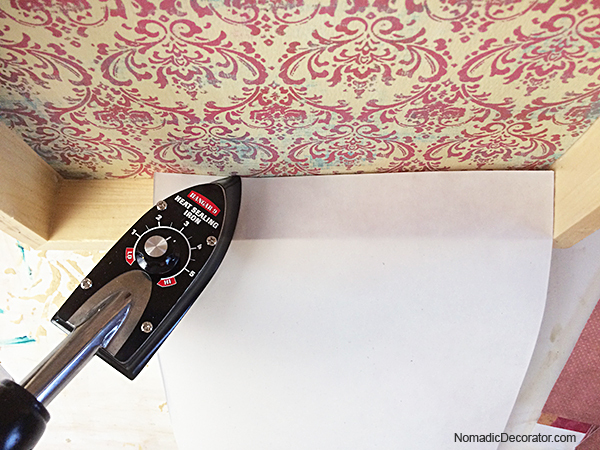 Smooth your paper onto the ornament. 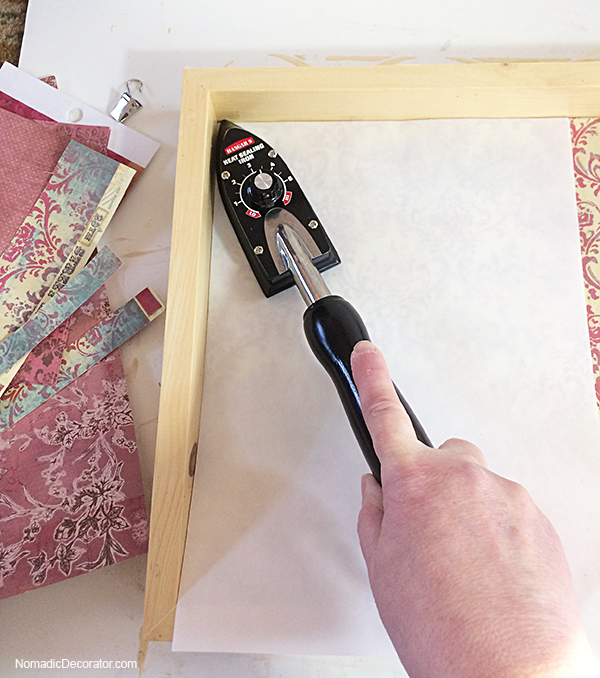 Press with your fingers from the inside out, to be sure all the paper adheres to the ornament. Pay extra attention to the edges. Sometimes you will need to press down on an edge for a few extra moments to be sure it adheres. 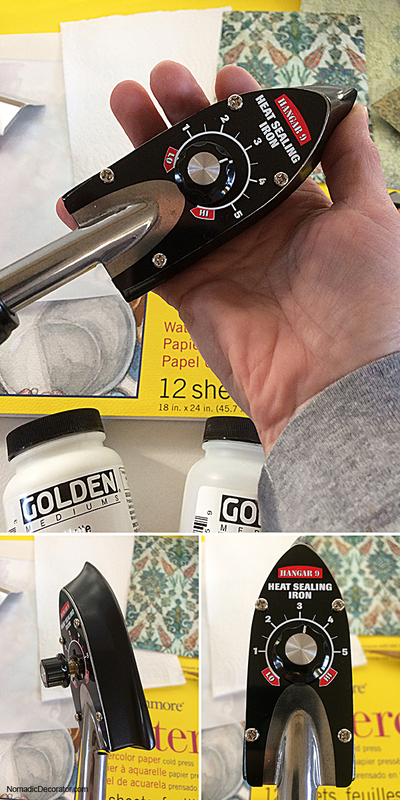 If any glue oozes out the sides, wipe it away with paper towel. 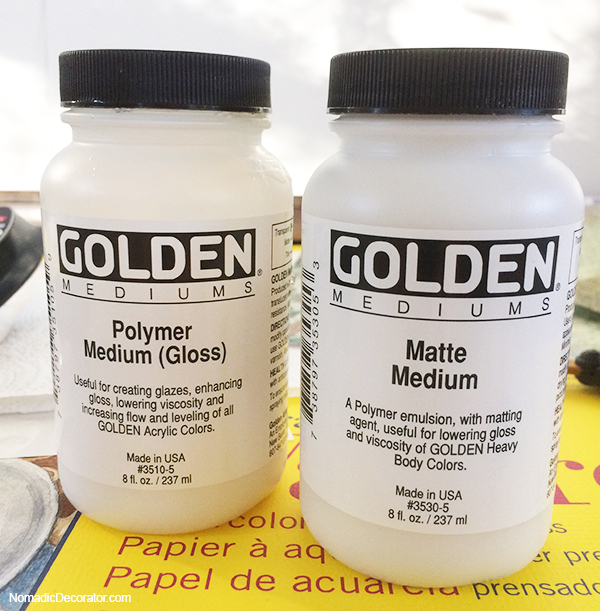 Be careful to not get glue on the glitter paper, because it might make dull spots. 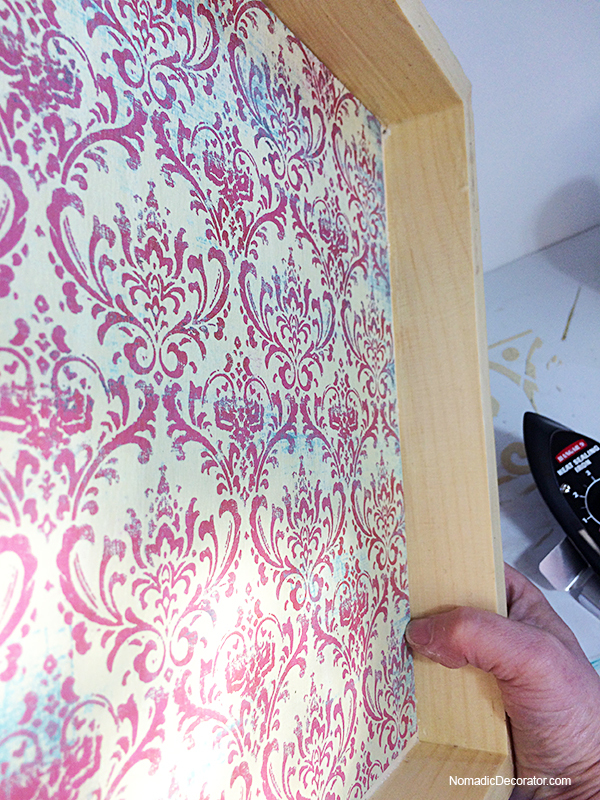 Now repeat the steps above to apply paper to the other side of the ornament. 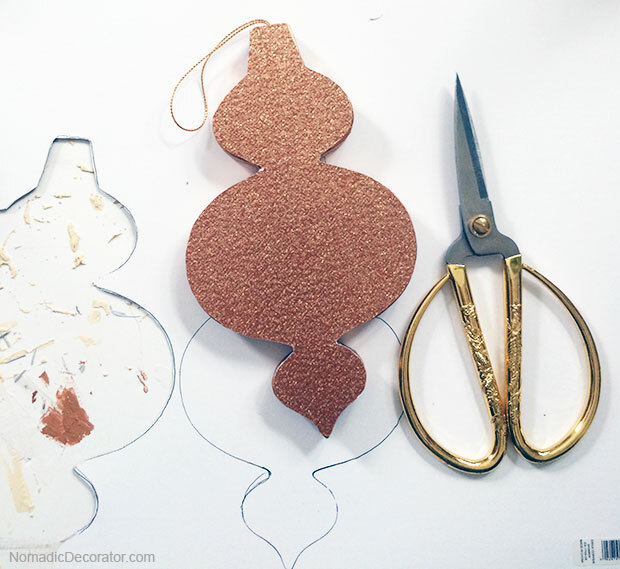 You can use the same paper, or a different paper, so you can flip the ornament around for a different look. 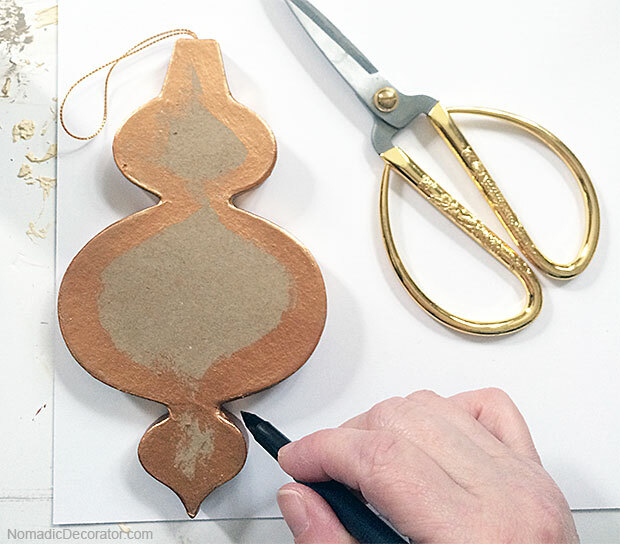 If any paper is sticking out beyond the edge of the ornament, you can cut it with scissors, or lay the ornament on a hard protected surface and slice the extra paper off with an Xacto knife. 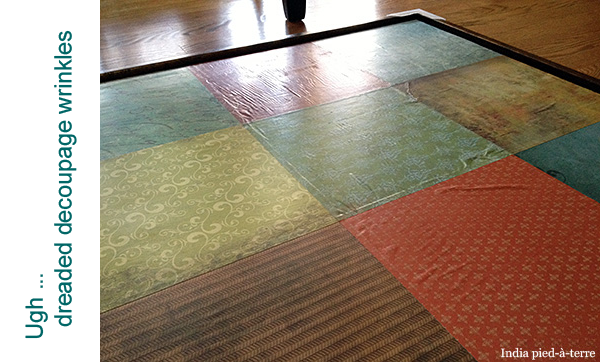 Set up an assembly line so you do all the tracing, then all the cutting, then all the gluing, then all the paper-applying. 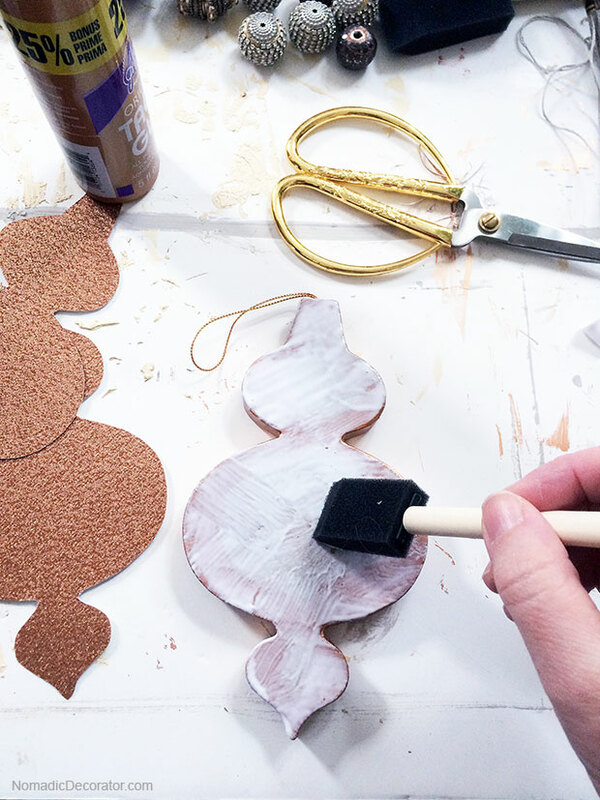 You’ll make many ornaments, fast. That’s it! 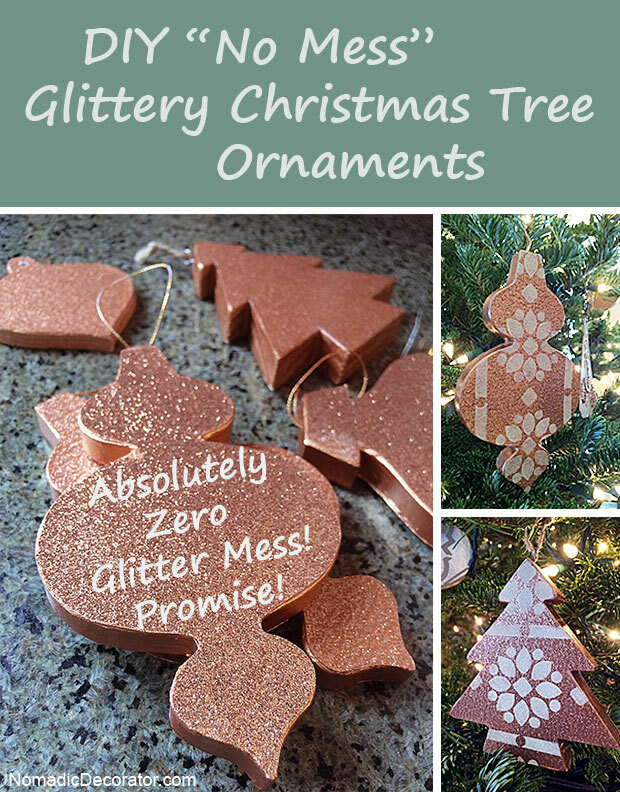 You have made a no-mess glittery ornament! Now have fun decorating and enjoying the holidays, not cleaning up glitter! The glittery ornaments are pretty just like this. The Christmas tree lights will bounce off of the ornaments, and make them sparkle. 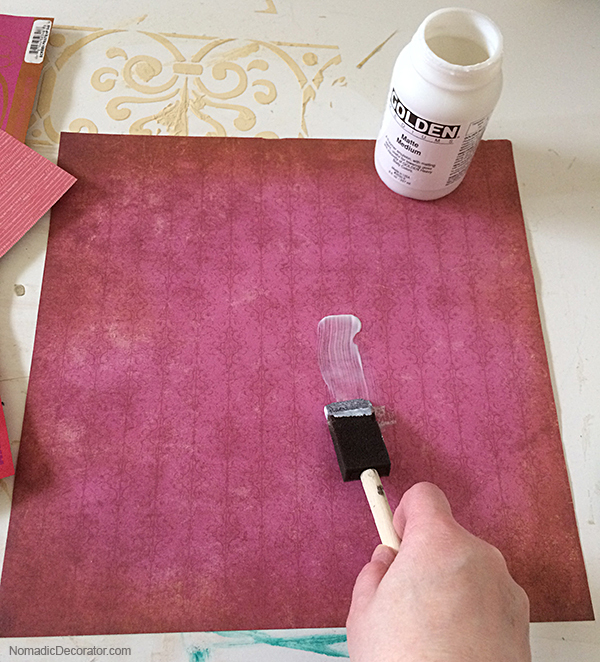 But if you want to add something more, how about painting stencils on the glitter paper? 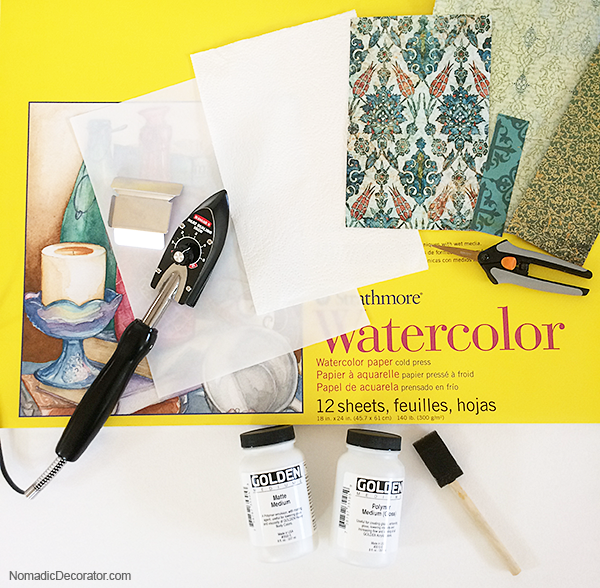 Come back for Part 2 of this tutorial, where I’ll show an optional step … adding stencil patterns with paint! This post is a bit early for Valentine’s Day, but if you like this idea, I wanted to give you enough time to get the supplies. 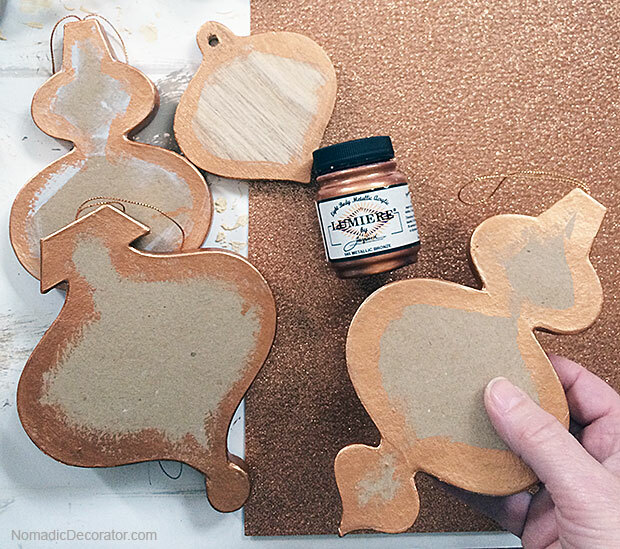 While stenciling Christmas tree ornaments a few months ago, I was loving the matte Chalk Paint from Annie Sloan on glitter paper. So I used the same combo for Valentine’s Day cards! 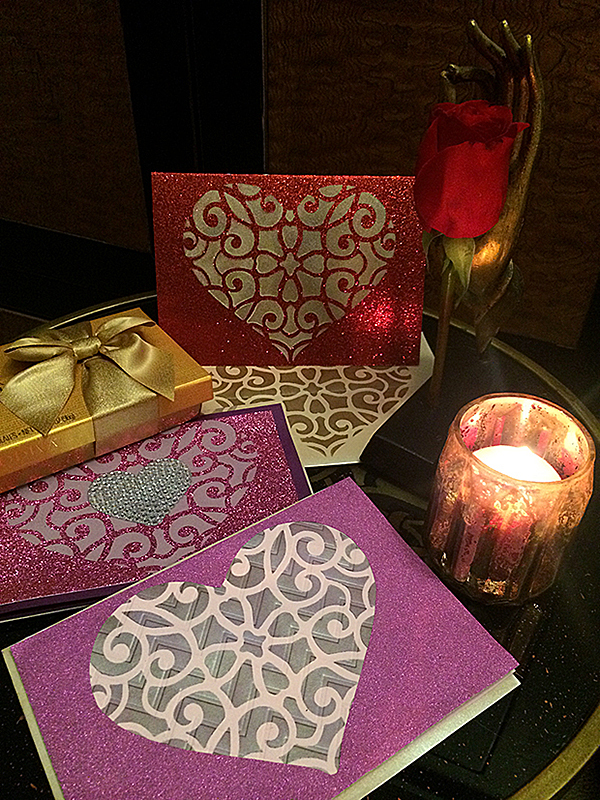 Glitter and glam, plus a personal card made by you — perfect for Valentine’s Day! I always love a photo shoot that requires (ahem yeah “requires” like it’s mandatory) good chocolates. Then you can eat the chocolate! Funny story — I originally bought a bigger box of Godiva truffles. I thought I was going to get to eat them. I left the box on the kitchen island and went to work. 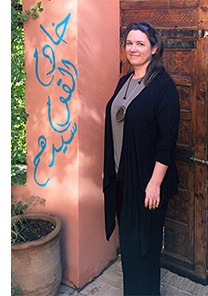 Meanwhile my husband left for a flight to his office in India that day. He took the chocolates for his staff over in Bengaluru. Which is okay — they are very much appreciated and they love the chocolates! But I had to get another (smaller) box for myself. For the photos. Yup. I guess I am greedy when it comes to chocolate. As you can see from the photos, I also bought a dozen red roses for myself! See that lilac color Chalk Paint (it’s Henrietta color from Annie Sloan) on the glitter paper? 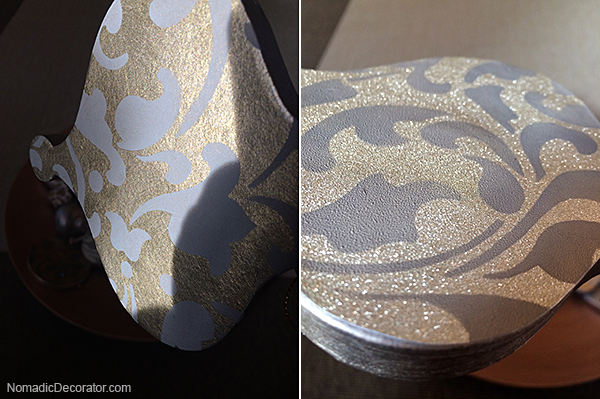 Cool matte vs. glitter texture contrast, huh? 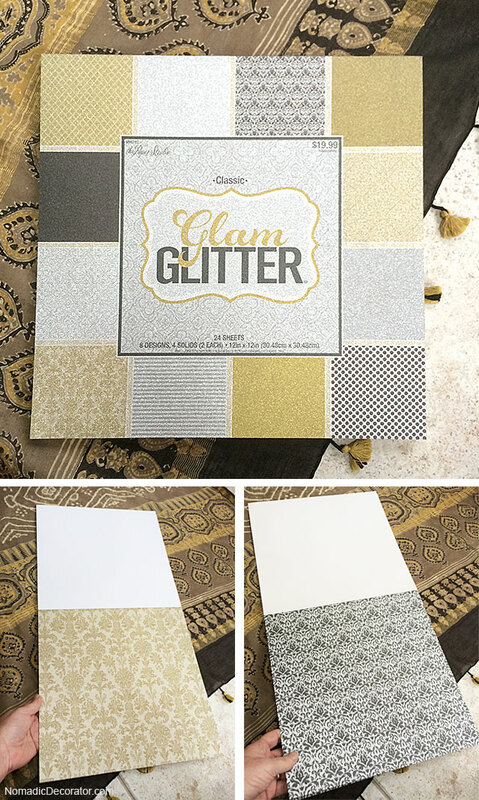 Here I will tell you more about where to get supplies like glittery paper, because I realize you might not find glittery paper in every corner store! 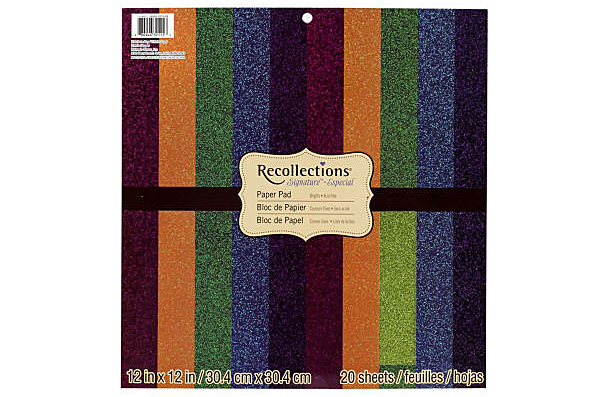 There’s a Michael’s craft store actually conveniently around the corner from my neighborhood, and I find lots of choices of glitter papers in their scrapbook/paper-crafting aisles. They have many colors — red, blues, purples, gold, silver, greens. I should mention, the glitter does not come off the paper. I’ve banned glittery Christmas ornaments from my house because all the glitter getting everywhere drives me crazy. 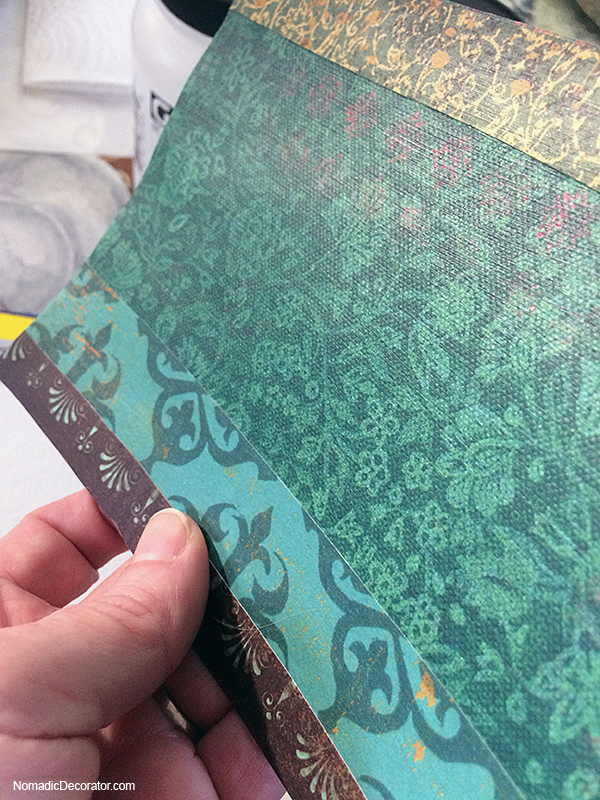 But these pre-glittered scrapbook papers are secure — the glitter goes nowhere! Now that I’m surfing Michaels’ site, I’m sorry so many papers seem to be available only in the stores, but there are still quite a few choices online. Paint will not go well over the huge pieces of glitter. 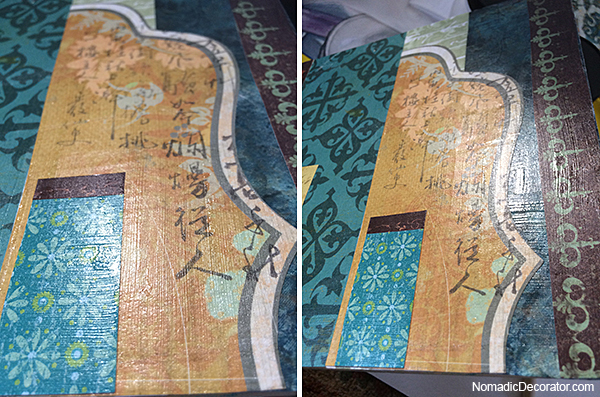 On the fine glitter papers, you will still see texture under the paint, but it’s subtle and okay. 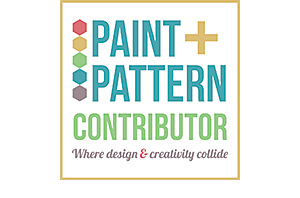 When shopping at craft stores like Michaels or Joann, sign up for their email lists. Don’t be afraid of spam – those emails always have coupons up to 50% off, sometimes 60%. They also often have coupons on their websites. Download their apps on your phone. When you’re in the store, open the app and look for their coupons. There are always coupons! You can easily get 30-50% off. 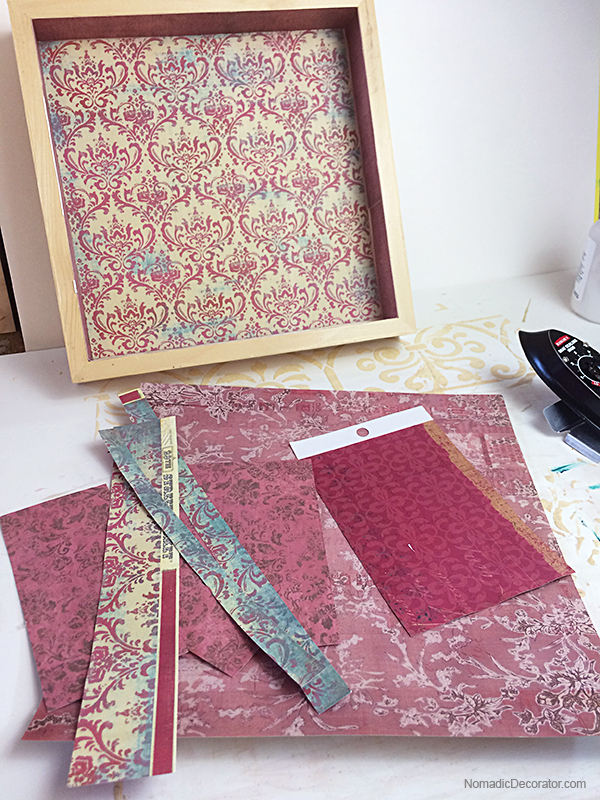 The lacey stencil I used to paint the heart is from Royal Design Studio. It’s the Lace Heart Wall Stencil. 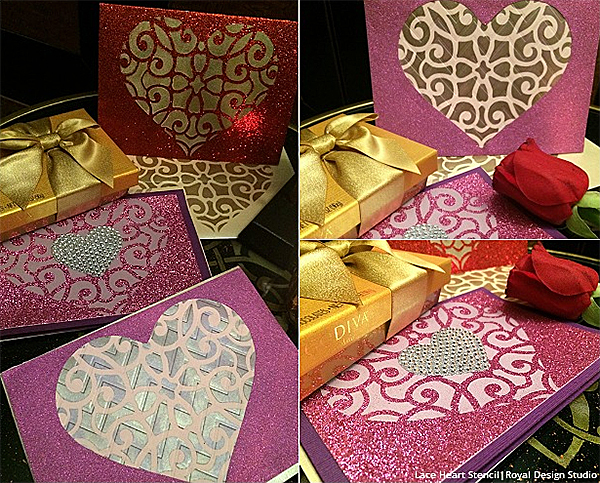 The design is 5.5″ wide and 4.5″ tall so it’s the perfect size for cards. 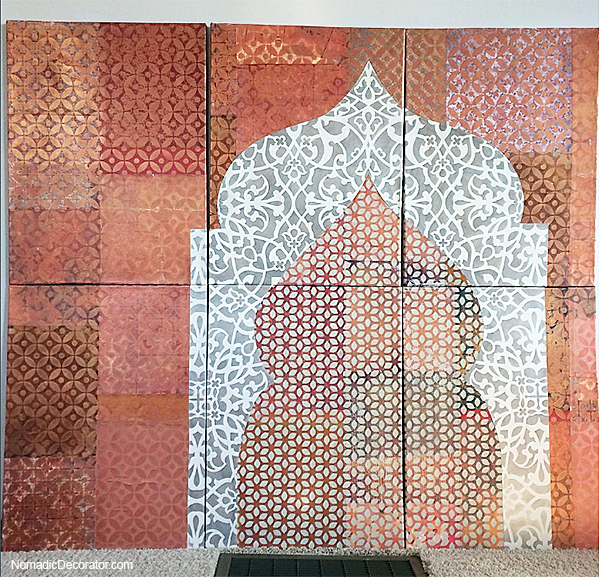 And yes, one stencil made these three different looks! The difference is in the color papers and color paint you choose. 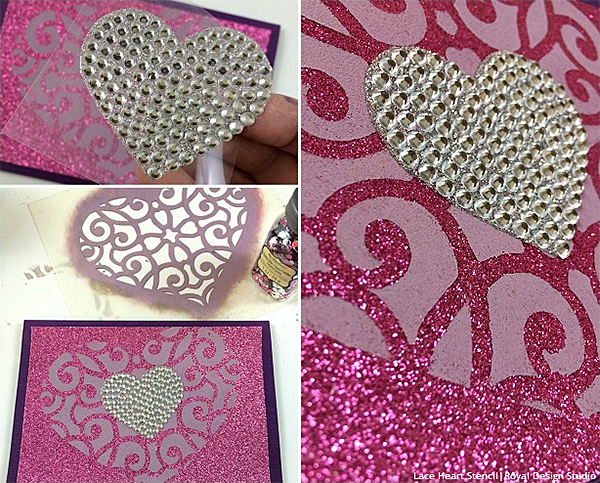 And as you see, you can cut a shape in the paper and have the stencil pattern peek through the cut-out, or you can paint directly on the glitter paper. 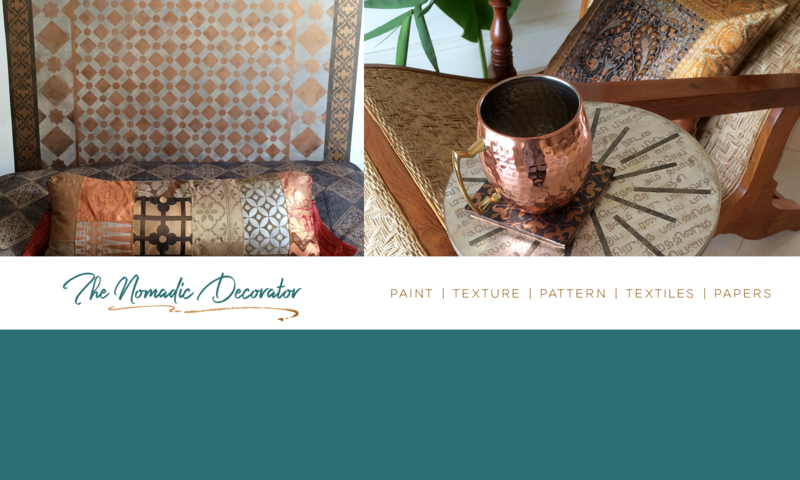 Also Royal Design Studio often has sales on stencils and supplies — sign up for their email list to get notice of discounts and sales in your email box. If you try this, have fun! It’s easy and fast to make these cards. I whipped these three cards out in an afternoon. It would probably be faster for you because I was stopping to take pictures for blogging. 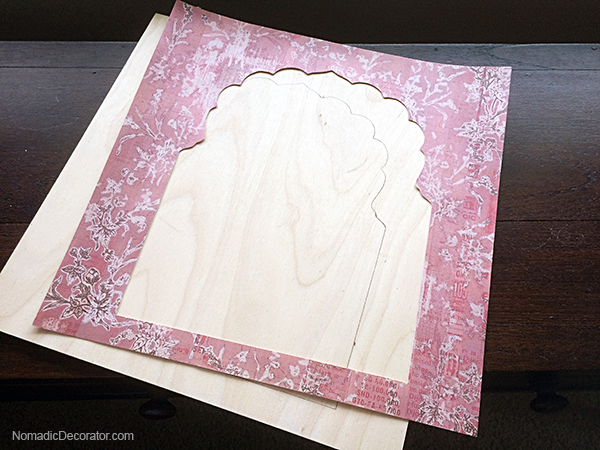 This is a fun project to do with kids too.